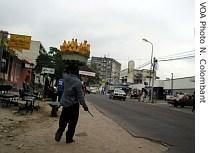 Crowds running away from police became a familiar scene in the last days of campaigning in Kinshasa. So was rioting, and people dying in election-related violence. There were also exchanges of gunfire between armed groups associated with former rebel-leaders-turned-candidates and the presidential guard. In other parts of the country, the situation was much the same. 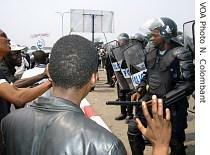 Many Congolese express concerns that the election was not well prepared and that losers might resort to violence. Congo's election Sunday pits incumbent President Joseph Kabila, the son of a former slain coup leader initially backed by Rwanda, against 31 other candidates. A volunteer for one of the presidential candidates says the international community, which already pays more than $1 billion in peacekeeping here, must remain committed. "When you bring in mind historical events of the country, all solutions that were imposed by overseas [foreign powers] were usually a failure," he said. "So that's why I think they should take care of all this situation to save the country and restore peace." Many opposed to Mr. Kabila think the vote is being rigged in his favor to protect European and American business interests in the country's vast mineral sector. Recent rallies for the opposition candidates have turned ominous, with demonstrators suggesting that foreigners will be killed if the president wins. A militant boycotting the process shared some of his rage with VOA. "Congolese people don't want Mr. Kabila," he explained. "If Kabila wins the election, we will be sorry because we will say he cheated, so Kabila will not be president of Congo. And if our election commission designated Mr. Kabila as president, Congolese people will be all the time in the streets to [ask for] our rights. And the Kabila-like dictator will oppress the people and it will not be good for everybody." Whether Mr. Kabila, or another former rebel leader loses, many are afraid the losers might take up arms again. The deputy head of the United Nations' huge peacekeeping mission, Ross Mountain, says the international community is well aware of such perceptions and fears. He insists the vote will be as free and fair as possible, given the challenges in the Democratic Republic of Congo. He says a successful election is key to restoring stability throughout Africa. He also says voting is just one part of the ongoing peace process. "We regard the elections as a central part of the stabilization process, an essential part, and an absolutely necessary part, but not sufficient for ensuring stabilization in the Congo," noted Mountain. "In order that this country stabilizes and plays the role, the potential of the country, which is enormous as you know with its rich mineral wealth and other resources, can be brought to bear for the benefit of the population, the international community will need to continue to stand by it in areas like security sector reform." Some Congolese try to be more positive in regards to the outcome of the election, like Sampao Kinsa, a supporter of the eldest candidate, Antoine Gizenga. He explains that historically, Congolese have tried to organize their own open election since the start of a national conference in 1991, when the power of the corrupt, long-time president Mobutu Sese Seko started declining. "Those who are saying they are preparing to fast, I think within more than 15 years, they've been unable to solve this problem," he said. "This is the point. We will receive more help from outside. People are suffering too much to solve this problem, we have to give legitimacy to the leaders and to make legal institutions, this is my point." A one-round legislative election will also take place Sunday, leading to the selection of a prime minister who will have expanded powers under a new constitution approved last December.